Battlestar Galactica vs. Babylon Five vs. Star Trek: Deep Space Nine--if this is the sort of deep conversations you have with your friends, Geek Fight by Kalan Vazquez might be for you. 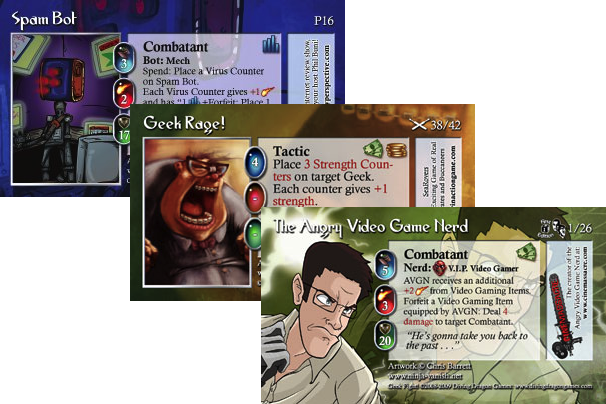 It'll take your real-life geek fights to the next level--the card game level. Geek Fight, currently a project on Kickstarter, is a Collectable Card game that's similar in nature to Magic: The Gathering, YuGiOh! But instead of battling with mythical creatures, you battle with geeky archetypes, like the Fan Boy, the Angry Video Game Nerd, and the Nostalgia Critic. The archetypes look like animation illustrations with furrowed-brows, tough visages and bodies ready to nerd-slam their opponents. To play the game, you and your opponent need a deck of 20 cards, and each person can be equipped with a maximum of 10 combatants. To succeed, your fighters should get along well--their skills should complement one another-- and have the proper resources to battle the enemy deck. You draw cards, reveal them, act (either winning or losing) then you retreat. If you lose your last available combatant, and can’t replace it, you’ve lost. But, this game is unique because in addition to the traditional winning and losing, you can also gain “Credibility,” which serves to enhance your geek reputation. Check out Diving Dragon Games’s website for a more detailed explanation of the rules. So far, three sets of Geek Fight cards are out now and circulating, and each set contains 42 cards. Kalan hopes to raise $20,000 through Kickstarter so he can have some extra capital to work on more sets and have card sleeves made.